A graphic novel project about being non-binary in a gender binary world. While the Talbot-Heindl Experience is a tiny company with big aspirations to do everything creative, we are most known for our quarterly compzine, The Bitchin' Kitsch. The B'K exists for the purpose of open creativity and seeks to be an outlet for people who may not otherwise have an opportunity to show their work. Check out this (in)famous zine and consider submitting today! 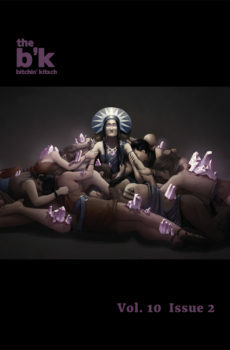 Check out our publication, The B'K, and find out why so many people fall in love with it and submit to it every quarter! Our guidelines are extensive because we aim to have a publication that is inclusive, diverse, and respectful. We've joined Patreon so that we can offer a B'K subscription! Sign up to receive an issue each quarter. We Have a Fall 2018 Chapbook Competition Winner! 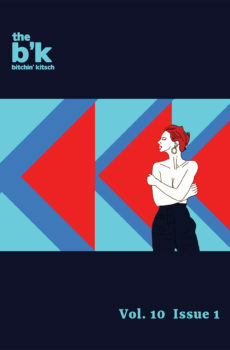 For the seventh time, The Bitchin’ Kitsch is proud to have received some wonderful chapbooks for our chapbook competition! And we’ve chosen our winner. 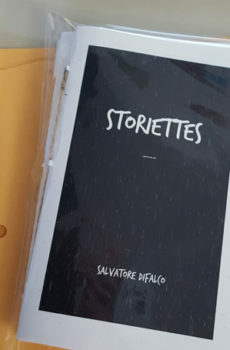 Congratulations to Salvatore Difalco for his winning chapbook Storiettes. The T-H Experience shop has all The B'K issues, zines, and all the inappropriate crochet you could possibly want! The Talbot-Heindls are into all things political, creative, and artistic. Chris and Dana's passion possessed them to spend all of their spare time creating content to feature their own work and others'. Here are their mini bios below. (They/Their) Chris's main objective in life is to enjoy life and creations wherever, however, and whenever they can. Chris is an avid reader, the editor of The B'K, a prolific zinester, and loves all things art, cats, and roller derby. (He/Him) Dana, aka McFishenburger, enjoys long walks on the beach, David Hasselhoff, dad jokes, video games, dismantling and rebuilding computer equipment, electronic music, artistic endeavors, and one-upping MacGyver. Check out Chris & Crampus - a photo zine featuring Chris & their uterus having the time of their lives all over Denver.